Without Easter there are fewer festivities to write about, but I’m looking forward to doing something nice for St George’s Day on the 23rd. In much the same way that I like to make a little fuss for St Andrew’s in November, I always like to raise a glass to St George at this time of year. The joys of a Scots-English upbringing (makes the rugby a nightmare, however). It’s also the 400th anniversary of the death of William Shakespeare, so I’ll be reading some plays and sonnets in his honour. Book nerd for life, man. Flowers, greenery and all things garden related. We’re doing some big work in our little patch and I can’t wait to share it. Fun things to do in the city (or the country, if that’s where you’re based), to make the most of the longer days. Even if it is raining. Getaway plans – whether it’s a day by the seaside one weekend, a long weekend away to capitalise on the upcoming May Bank Holidays, or looking forward to the summer, now is the ideal time to share! Home projects! We are going to move my study to another part of the house, with better storage options and more natural light for photos. It’s going to take weeks (flatpack furniture my friends, always a challenge), but I’m excited to reveal the new digs once we are done. New recipes and meals using the wealth of produce that’s coming into season now. Spring cleaning posts. Whether you’re a Kondo aficionado or just want to move the piles of stuff into slightly neater piles of stuff, it’s definitely the season for sprucing. Health posts – there’s something about the better weather that makes one want to refocus and break out of hibernation a little, no? Special days can be fun to commemorate if they fit with your likes, passions, causes or hobbies. As well as the festivals I’ve mentioned above, there are also lots of food based events for bloggers who write on this. April 2nd is PB & J Day – I’m going to look for some cookies using these two ingredients to make and share. On the 11th it’s National Cheese Fondue Day. I need little provoking when it comes to fondue, so I’ll be heading out for some cheese based goodness to celebrate. Then the 12th is Grilled Cheese Sandwich Day, so I’ll be making good friends with the cross-trainer. Towards the end of the month the 24th is Sauvignon Blanc day- as it’s one of my favourite wines I’ll be sure to enjoy a glass or two. From Saturday 16th the Undressed: A Brief History of Underwear exhibition opens at the V&A. I’ll be attending for the witty name alone. On the 23rd Trafalgar Square will be full of festivities for St George’s Day, with a Shakespearian slant. Also from the 23rd the City Garden installation will open over in the City Centre – I’m looking forward to heading over to see a glimpse of this floral piece. The 24th sees the London Marathon, and many in the city will be heading out to cheer on the brave runners (or watching at home with toast and tea. Always a great day. On the 30th, at the start of the spring bank holiday, the Canal Calvacade will take place in Little Venice. 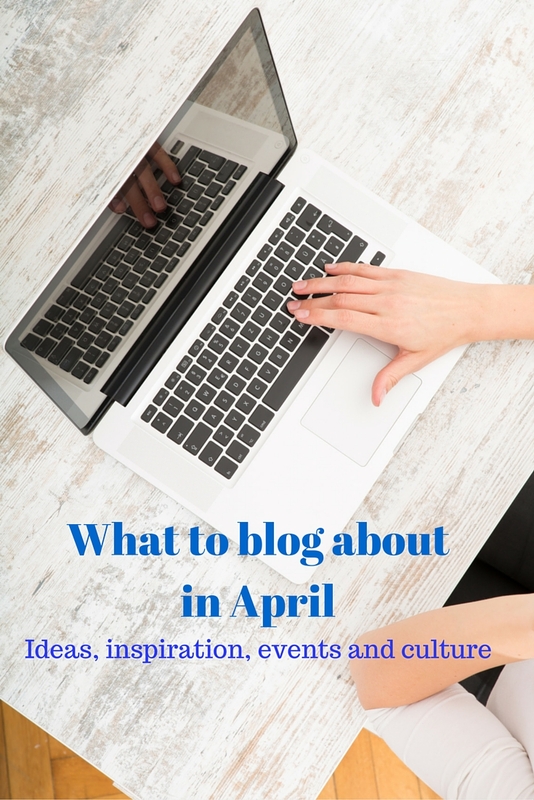 I’ll blog later about some of the cultural elements I’m looking forward to in April, but I hope you’ve found some inspiration here for your April blogging. Have fun! These are excellent inspiration – I shall be returning to this post!